While in port in Quebec City, admire the buzzing metropolis from the air on this exciting helicopter tour. 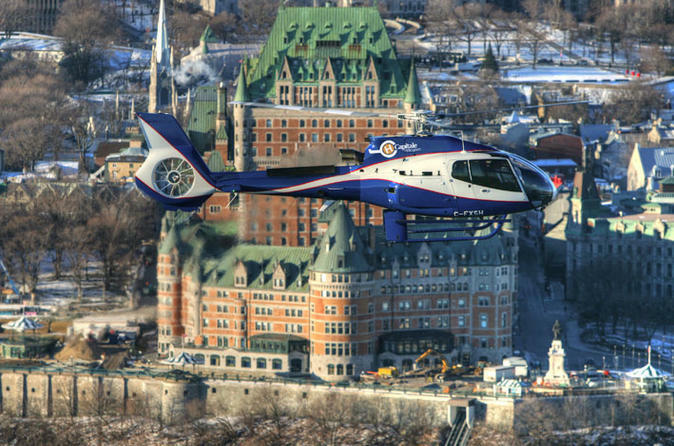 Hop aboard your state-of-the-art helicopter and soar high over Quebec City during your 12- to 15-minute flight. Take in panoramic views over top city attractions including Old Quebec, Château Frontenac, Cap Diamant, the Plains of Abraham, Ile d'Orléans, St Lawrence River and the city’s mighty bridges. As you fly through the skies, listen as your pilot highlights the points of interest in the landscape below and shares insight into the city’s history.